Download "Developing a Theory-Based Ontology for Best Practices Knowledge Bases"
1 Developing a Theory-Based Ontology for Best Practices Knowledge Bases Daniel E. O Leary University of Southern California 3660 Trousdale Parkway Los Angeles, CA Abstract Knowledge management systems are becoming more widespread. As part of those knowledge management systems, increasingly, firms are developing best practice knowledge bases that summarize a wide range of enterprise processes. Central to those particular knowledge bases are common languages, also referred to as ontologies, that are used to facilitate access and navigation through the knowledge base. This paper summarizes some of the evidence as to the necessity of common languages in best practice databases. In addition, some of the problems standing in the way of these common languages and the way that they have been built to-date also are summarized. Then this paper proposes a process for building an ontology or a common language for such best practice databases. That process is based on using the enterprise model of resources, events and agents to generate metalevel requirements, and function as an ontology generator. Generic process description is available from the value chain work of Porter. 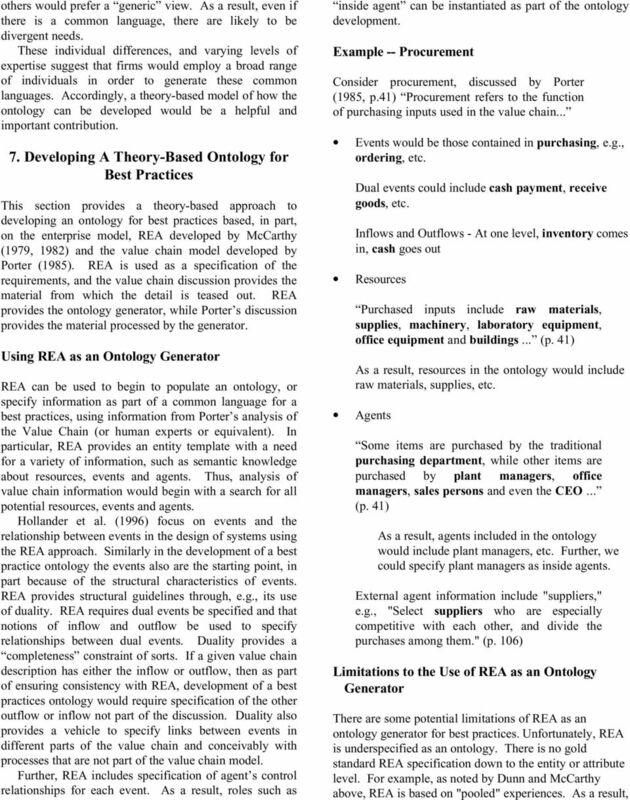 The REA structure would then be used to analyze a generic process description, teasing out necessary ontology information, in order to develop an ontology for that process. 1. Introduction Increasingly, firms are developing best practices knowledge bases as part of their knowledge management systems. Best practices (or leading practices) knowledge bases provide access to enterprise processes that appear to define the best ways of doing things. 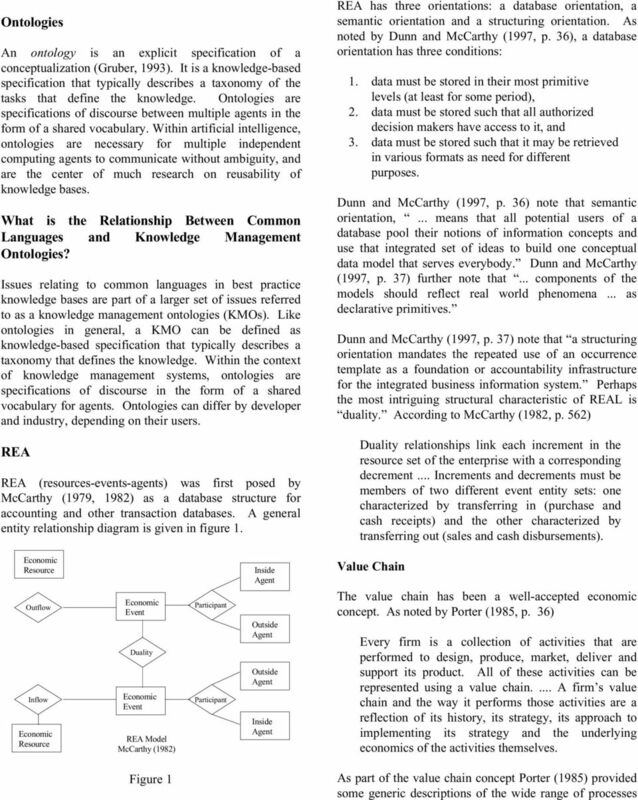 At the base of these best practices knowledge bases are ontologies (Gruber 1983), what the developers (e.g., Price Waterhouse, 1997) call a common language or (International Benchmarking Clearinghouse 1997). 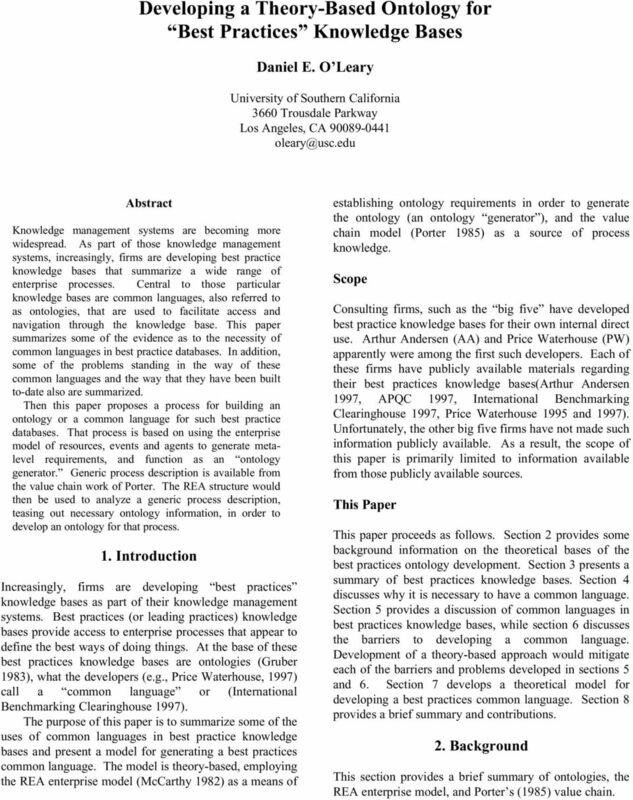 The purpose of this paper is to summarize some of the uses of common languages in best practice knowledge bases and present a model for generating a best practices common language. The model is theory-based, employing the REA enterprise model (McCarthy 1982) as a means of establishing ontology requirements in order to generate the ontology (an ontology generator ), and the value chain model (Porter 1985) as a source of process knowledge. Scope Consulting firms, such as the big five have developed best practice knowledge bases for their own internal direct use. Arthur Andersen (AA) and Price Waterhouse (PW) apparently were among the first such developers. Each of these firms have publicly available materials regarding their best practices knowledge bases(arthur Andersen 1997, APQC 1997, International Benchmarking Clearinghouse 1997, Price Waterhouse 1995 and 1997). Unfortunately, the other big five firms have not made such information publicly available. As a result, the scope of this paper is primarily limited to information available from those publicly available sources. This Paper This paper proceeds as follows. Section 2 provides some background information on the theoretical bases of the best practices ontology development. 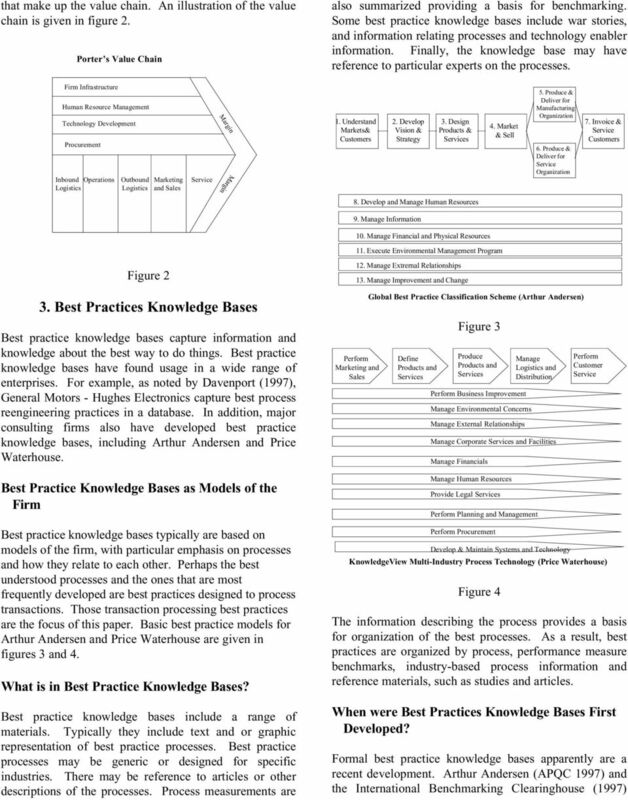 Section 3 presents a summary of best practices knowledge bases. Section 4 discusses why it is necessary to have a common language. 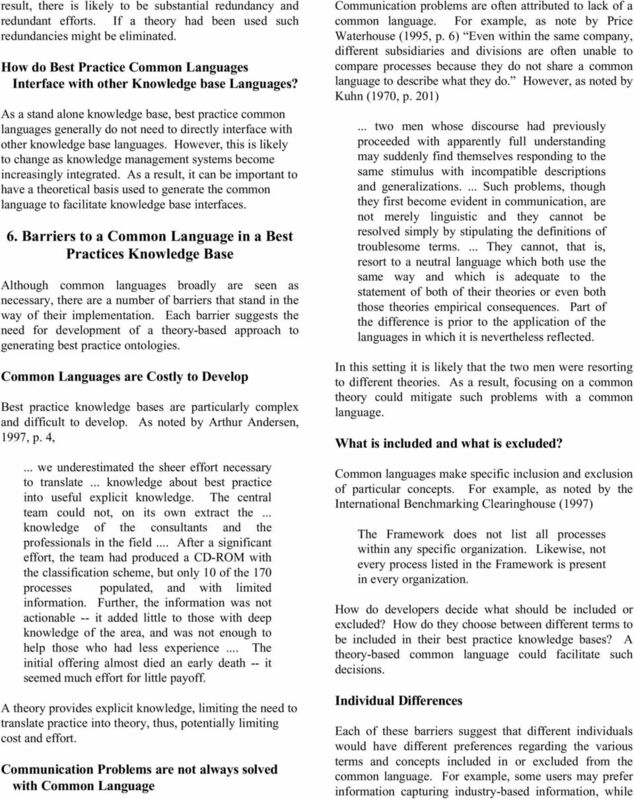 Section 5 provides a discussion of common languages in best practices knowledge bases, while section 6 discusses the barriers to developing a common language. Development of a theory-based approach would mitigate each of the barriers and problems developed in sections 5 and 6. Section 7 develops a theoretical model for developing a best practices common language. Section 8 provides a brief summary and contributions. 2. 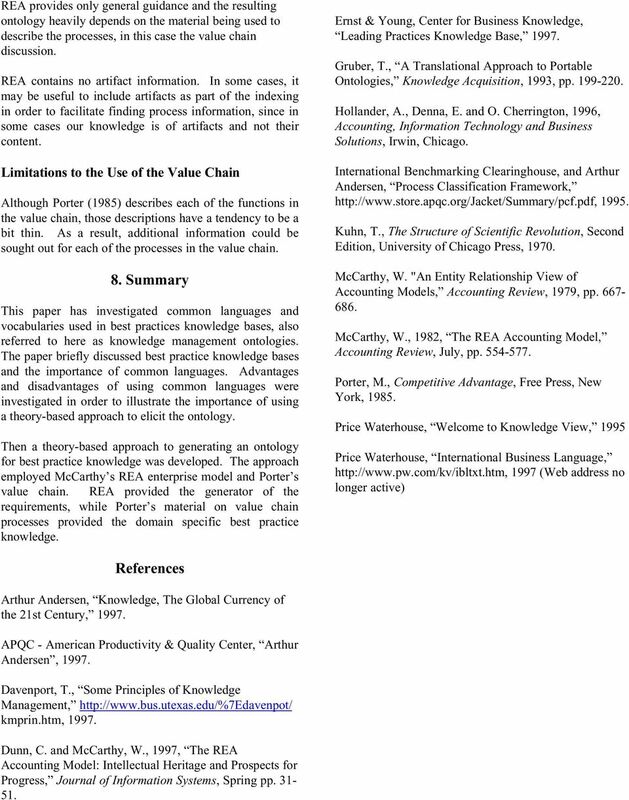 Background This section provides a brief summary of ontologies, the REA enterprise model, and Porter s (1985) value chain. 1.1 What Is REA? 4 1 Structural Patterns at Operational Level. Fig. 1. Fundamental REA concepts. party. clause. provide. reservation. REA Management Ontology: Conceptual Modeling of Accounting, Finance and Management Control Walter S.A. Schwaiger Institute of Management Science TU Wien, Vienna, Austria Walter.schwaiger@tuwien.ac.at Abstract. Independent Insight for Service Oriented Practice. An SOA Roadmap. John C. Butler Chief Architect. A CBDI Partner Company. www.cbdiforum. Independent Insight for Oriented Practice An SOA Roadmap John C. Butler Chief Architect A CBDI Partner Company www.cbdiforum.com Agenda! SOA Vision and Opportunity! SOA Roadmap Concepts and Maturity Levels! Co-Creation of Models and Metamodels for Enterprise. Architecture Projects. Business Process Modeling Approaches in the Context of Process Level Audit Risk. Assessment: An Analysis and Comparison. Three Events That Define an REA Methodology for Systems Analysis, Design, and Implementation b y Julie Smith David Arizona State University Preliminary, please do not quote without the author s permission.